I realise how risky this post might be. 1) Its inhumane. 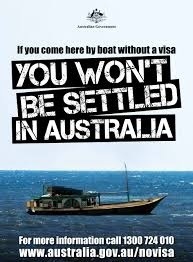 we seem to have breached a number of international conventions and laws in our efforts to ‘stop the boats’. When Australia’s human rights record is spoken of in the same breath as places like North Korea, Syria etc, its time for a pretty serious rethink of the way we treat people. 2) Its unchristian. “When a foreigner resides among you in your land, do not mistreat them. The foreigner residing among you must be treated as your native-born. Love them as yourself, for you were foreigners in Egypt. I am the Lord your God.”Leviticus 19:33-34 (NIV). This is one of any number of verses that make it very clear how foreigners are to be treated. Both Old and New Testaments are pretty much unequivocal on this point. The fact that our current policy is being steered by someone who (apparently) claims to be a Christian is especially troubling. 3) It’s politically dangerous. We are sending a bunch of people to be resettled in Papua New Guinea. Quite apart from the obvious cultural shifts that will take place in that country – Papuans apparently don’t like them very much – we are in danger of creating a people group who will not look kindly on Australia’s treatment of them. People who will tell their children what has happened. This is how radicals are made, who see violence as their only recourse to be heard. This will not make us any friends and we may well end up with a fairly angry group of people sitting on our northern doorstep, a problem of our own making. All of this may well be overly simplistic and I don’t claim to be an expert on the issue. I get that any country needs to secure its borders and Australia is no exception. But there has to be a better way and I simply cannot sit by and be silent about this any more. Our treatment of these people is wrong at nearly every level. It is damaging our credibility internationally, and perhaps more importantly, it is damaging our national psyche. We are hurting ourselves, creating a divisive society that will be damaged by the fractures and tensions that nearly always come when a government alienates and demonises a group of people for the sake of popularity.